Classic Film and TV Café: Who is the tall dark stranger there? Maverick is the name. Who is the tall dark stranger there? Maverick is the name. Maverick remains one of the classic TV westerns that emerged from the genre's heyday, from the mid 50s to the mid 60s. It followed the success of Cheyenne, Warner Bros. first Western to appear on television courtesy of ABC. At that time ABC was a fledgling network that needed to bolster its roster against Sunday night favorites The Steve Allen Show and The Ed Sullivan Show. It asked Warner Bros. to provide them with a series that would help increase their ratings. Cheyenne debuted in 1955 as one of three rotating dramas on Warner Bros. Presents, appearing every three weeks along with television versions of Casablanca and Kings Row. Cheyenne quickly became a favorite and set the stage for several more Warner Bros. created westerns including Bronco Lane, Sugarfoot, The Lawman, and Colt 45. For the most part these were traditionally structured westerns with recognizable good guys and bad guys with the hero always triumphant in the end. Maverick started out in the same vein when it debuted in 1957, but creator turned producer Roy Huggins had other ideas and instituted the novel changes that transformed Maverick into a landmark television show. Maverick had been designed as a one star show, but due to its six-day filming schedule and with James Garner as the only actor, not enough episodes were being produced to fill ABC's need. The decision was made to create a brother for Brett Maverick, Bart Maverick, played by Jack Kelly. Kelly joined the series in the eighth episode. The prevailing concept was that Bart's character was to be written as if it were Brett's character and writers were told to think of Brett even when they were writing about Bart. The only difference was in the acting style of both men. Indeed, only one script was written specifically for Kelly. Kelly's character had to dress exactly like Brett, with the same colors, clothing and style. The costumes worn by the Maverick brothers were more reminiscent of the dark sinister outfits assosciated with villains. One of the major twists developed by Huggins was to insert an element of comedy and satire into the series and presenting Brett and Bart as rather self-serving card sharks roaming from riverboat to saloon looking for an easy way to make money and avoiding serious consequences at all costs. They were not the fastest guns in the West and their confrontations usually ended in a victorious fist fight. Each week's episode featured either Brett or Bart and a few times they appeared together. There were several recurrent guest stars including Efrem Zimbalist, Jr. as Dandy Jim Buckley and Diane Brewster as Samantha Crawford, a shady lady who gave the Maverick brothers a run for their money. Along with other writers Huggins fashioned scripts that included spoofs of Bonanza and Gunsmoke. The Gunsmoke episode was entitled Gun Shy and featured a hick Marshall named Mort Dooley. An hysterical sendup of Bonanza had the Maverick brothers involved with Joe Wheelwright and his three sons Moose, Henry, and Small Paul. In an episode titled Hadley's Hunters all of the actors from Warner Bros. other westerns appeared as their characters, with Edd "Kookie" Byrnes of 77 Sunset Strip cast as a blacksmith. 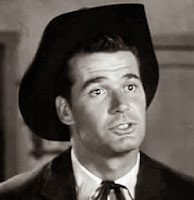 In 1960 James Garner left the show over a contract dispute and Warner Bros. brought in Roger Moore to play cousin Beau Maverick. Moore left the series complaining about the lack of quality in the scripts he was receiving. That led Warner Bros. to bring in a third Maverick relative Brent Maverick played by Robert Colbert, who lasted only one season. That left Jack Kelly appearing in 13 original episodes alternating with reruns of episodes featuring Garner until the series was canceled in 1962. Maverick is still considered an iconic western. It was full of fun and spoofery and represented a successful attempt to imbue the traditional Western with comedic elements. Labels: edd byrnes, jack kelly, james garner, maverick, robert colbert, roger moore, sazball (author), warner bros.
Saz, I saw the "Gun Shy" episode a couple of years ago and thoroughly enjoyed it. But it's hard to replicate a unique series like MAVERICK, though the networks certainly tried. There was the 1978 TV-movie THE NEW MAVERICK, a short-lived TV series called YOUNG MAVERICK, and the 1981 revival BRET MAVERICK with Garner back in his famous role. But none of them clicked. Garner was the best part of the big screen adaptation of the series with Mel Gibson. Thank Goodness we can still see this series every weekday on the Encore Western Cable Channel I loved this show as a child and love it more now. I loved Maverick... still do. James Garner is one of the finest actors ever. I'm just bummed that my favorite movie of his isn't in the poll on this page.... My Fellow Americans was brilliant.